An office trailer can be a lifesaver for a work area with limited space. These trailers may seem small but if the spaces are utilized properly, this will make the difference between a well-organized and employee friendly space, and an unorganized, underutilized space that no one will want to use. Dear John Trailer rental, proudly serving Pittsburgh, Youngstown, Wheeling, Akron, Cleveland, and the surrounding areas, has some suggestions for your office trailer space to make it user friendly, and super-efficient. Buy a desk or two! 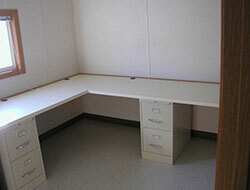 An office trailer should be utilized like any other office space and that includes a desk. The space is most likely large enough for one large desks, and a second smaller desk if necessary, so set up two in the most space efficient way possible. Be sure to leave space for seating for customers or employees. Because the space is small, invest in desk top organization, filling folders, hanging wall folders, whatever works in your space, to keep things organized. The cramped space will seem even more cramped if it is cluttered and unorganized. Set up a space for the mail, incoming and outgoing, to again, be organized and keep things flowing. Your office trailer will help your business. Be prepared for the long haul by setting it up as an efficient office space. Call Dear John Trailer rental today for assistance today.